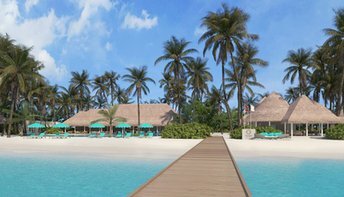 This beach ranks #8 of the "Best islands in Dhaalu atoll"
Sun Aqua Iru Veli is a five-star "all inclusive" hotel with rooms' rates starting from US$800 per night. The largest room is 643 square meters, thus being extra spacious even by the standards of Maldives. Fly to Maldives international airport (MLE). Next take 45-minutes flight by a seaplane. Fare for the round trip is US$500 for adult, US$325 per child up to 12 years old, free for infants up to 2 years old. The best time for a beach holiday on the island of Sun Aqua Iru Veli is a dry period in the winter half of the year.